grandma's cookie jar: Fun with the Grandsons - Let's Go on a Candy Cane Hunt! Fun with the Grandsons - Let's Go on a Candy Cane Hunt! Yesterday when I looked up my crocheted shark hat pattern on Pinterest (I'm making shark hats for the boys this year) I saw a great idea for Holiday fun which I knew I had to plan to do with my grandsons and share with you . . . the specifics on having a candy cane hunt - which you will find at this link! 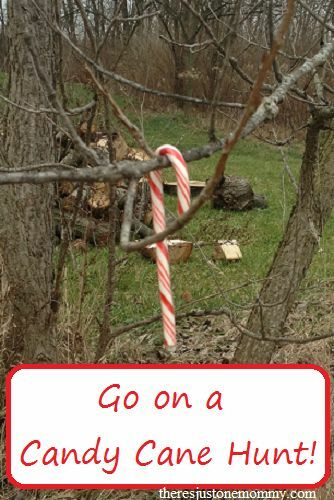 What is a candy cane hunt you ask? Well, think Easter Egg hunt and substitute candy canes and you are on the right track! I'm going to wrap eight candy canes for each boy and put them under the tree. When the boys are at my house Saturday, they will be able to open their candy canes, then when their parents come for supper, we will have them hide the candy canes outside - I have lots of trees with branches at the right heights for the boys and since they are candy canes, they will easily hang on the branches. The boys will get to go outside and each will be able to search my yard for eight candy canes. Then, I will have them each take two of their candy canes to put in a bag with directions for how to have a candy cane hunt and they will be able to give it to their neighbor, so he can have a candy cane hunt, too! The shape reminds us of the shepherd's crook - and shepherds were the first people to learn of Jesus' birth! Turn a candy can upside down and you have a "J" - for Jesus! The color red reminds us of how the Bible tells us in Isaiah 1:18 our sins are red like scarlet. The white on the candy cane reminds us of how the Bible tells us Jesus washes our sins away so we are as white as the snow! The stripes remind us of how Jesus died for our sins. It is candy and sweet - like Jesus' love for us! Sounds like fun all around! If you try this with your grandchildren, be sure to have a camera available as there will likely be opportunities for some great photos! Enjoy!